In the third part of this excellent review paper (1) we look at the empirical evidence is presented suggesting that MBIs ameliorate addiction by enhancing cognitive regulation of a number of key processes. When individuals are unable to marshal effective problem-solving to resolve a stressor, lack of a favorable resolution may lead to deployment of emotion regulation efforts to manage the emotional distress elicited by the stressful circumstance. Neuroimaging research has provided evidence for a reciprocal, dual-system neural network model of emotion regulation comprised of a dorsal brain system (e.g., dlPFC, dACC, parietal cortex) subserving top-down cognitive control, and a ventral brain system (e.g., amygdala, striatum) subserving bottom-up emotional impulses (133–135). Top-down engagement of proactive cognitive control mechanisms regulates negative affect and attenuates the effects of emotional interference on cognition (135–138), and is associated with increased activation of PFC which in turn attenuates amygdala activation (139, 140). Research suggests that dysregulated emotional reactions occur when the reciprocal balance between the relative activation of bottom-up and top-down neural circuits becomes tipped in favor of bottom-up processes (141). A number of studies suggest that mindfulness training may counter this imbalance and augment emotion regulation [for reviews, see Ref. (78, 142)] by restructuring neural function in favor of context-dependent top-down control processes. For example, Goldin and Gross (143) demonstrated that individuals with elevated negative affect at baseline who later received mindfulness training exhibited increased emotion regulatory capacity coupled with greater recruitment of attentional control resources and reduced amygdala activation during exposure to negative, self-relevant stimuli. Thus, by enhancing top-down cognitive control over emotional responses in a context-dependent fashion, MBIs may reduce drug use precipitated by negative affective states. Importantly, MBIs provide training in cultivating a state of mindful awareness and acceptance of the extant emotional response as a precondition for emotion regulation. While acceptance of aversive mental experience may itself result in reduced negative affect (144), mindfulness training may also exert downstream facilitative effects on cognitive regulation of emotion following the acute state of mindfulness. For instance, mindfulness training may promote cognitive reappraisal, the process by which the meaning of a stressful or adverse event is re-construed so as to reduce its negative emotional impact (125). One theoretical model posits a multi-stage process of mindful emotion regulation (1, 145). According to this model, during an adverse experience mindfulness practitioners first disengage from initial negative appraisals into the metacognitive state of mindfulness in which cognitions and emotions are viewed and accepted as transitory mental events without inherent veridicality. Subsequently, the scope of attention broadens to encompass a larger set of previously unattended information from which new situational appraisals may be generated. By accessing this enlarged set of contextual data, present circumstances may be reappraised in an adaptive fashion that promotes positive affect and behavioral activation. For instance, a newly abstinent alcohol dependent individual might reappraise an affront by a former “drinking buddy” as evidence of their need to build new, sober relationships. In support of this model, recent studies indicate that mindfulness during meditation predicts enhanced cognitive reappraisal (146), which in turn mediates the association of mindfulness and reduced substance craving (147). This context-dependent use of prefrontal regulatory strategy represents a “middle way” between hypo- and hyper-activation of cognitive control resources, thereby preventing resource depletion and untoward rebound effects. Speculatively, this “mindful reappraisal” process may involve spreading activation in a number of brain networks. Generating the state of mindfulness in the midst of a negative affective state may activate the ACC and dlPFC (148, 149), which could facilitate metacognitive monitoring of emotional reactivity, foster attentional disengagement from negative appraisals, and regulate limbic activation. In so doing, the acute state of mindfulness may attenuate activation in brain areas that subserve self-referential, linguistic processing during emotional experience (e.g., mPFC) while promoting interoceptive recovery from negative appraisals by increasing activation in the insula (113). Metacognitive disengagement from the initial negative appraisal may result in non-elaborative attention to somatosensory information, thereby facilitating the set shifting process of cognitive reappraisal, as brain activations shift from posterior to anterior regions of cortex centered on the node of the OFC. During this process emotional interference is attenuated while alternate appraisals are retrieved from memory and evaluated for goodness-of-fit to situational parameters and demands (150). The effects of mindfulness-centered regulation of negative emotion might be measured with a standard emotion regulation paradigm [c.f. (137)], in which participants are instructed to use reappraisal to reduce negative affect in response to exposure to aversive visual stimuli [e.g., images from the International Affective Picture System; (151)]. In this task paradigm, mindfulness practitioners may exhibit enhanced reappraisal efficacy, as evidenced by reduced self-reported and psychophysiological responses to aversive stimuli on reappraise relative to attend trials. In that regard, a study employing ERP analysis found that when compared to controls, meditators exhibited significantly greater reappraisal efficacy as evidenced by significantly larger attenuation of brain activity during reappraisal of stressful stimuli in centro-parietal regions subserving attentional and emotional processing (152). In addition to pro-regulatory effects on emotion, mindfulness training may facilitate neurocognitive regulation of the effects of stress on the autonomic nervous system. As addicts in treatment develop dispositional mindfulness through mindfulness training, they may be more able to engage prefrontal cortical modulation of the sympathetic “fight-or-flight” response via parasympathetic nervous system activation of the “vagal brake,” resulting in increased HRV and heart-rate deceleration in the face of stress or addictive cues (153, 154). Thus, increasing dispositional mindfulness may be reflective of greater neurovisceral integration and flexibility in the central autonomic network (67). This network is comprised of neuroanatomic and functional linkages between central (e.g., PFC and ACC) and autonomic (e.g., vagus nerve) nervous system structures which coordinate the self-regulation of attention, cognition, and emotion while exerting regulatory influences over perturbations to visceral homeostasis (155), such as those that might be evoked in abstinent substance dependent individuals exposed to stressful and/or substance-related stimuli. Mindful individuals may have greater capacity for contextually appropriate engagement and subsequent disengagement of neurocognitive resources in response to the presence and absence of stress and drug-cues. Such autonomic flexibility (156) engendered through mindfulness training may help persons in recovery from addiction adapt to situational demands without succumbing to a stress-precipitated relapse. This hypothesis is consistent with evidence of the effects of mindfulness on neural function in dlPFC and ACC (149, 157), key structures involved in central autonomic regulation of HRV via downstream influences on the amygdala and hypothalamus (158, 159). Congruent with such findings, MBIs increase parasympathetically mediated HRV to an even greater extent than relaxation therapy (160,161), and decreases sympathetically mediated indices of stress (8), including blood pressure (162), heart rate (163), skin conductance responses (161), and muscle tension (164). These effects of mindfulness-centered regulation on autonomic function may result in improved ability to manage substance cue-reactivity. In support of this hypothesis, a Mindfulness-Oriented Recovery Enhancement intervention for alcohol dependence increased HRV recovery from stress and alcohol cue-reactivity (7). Congruent with this finding, relative to their less mindful counterparts, alcohol dependent individuals with higher levels of dispositional mindfulness exhibited greater attentional disengagement from alcohol cues which predicted the extent to which their HRV recovered from alcohol cue-exposure levels (67). Lastly, persons participating a mindfulness-based smoking cessation intervention who exhibited increased HRV during mindfulness meditation smoked fewer cigarettes following treatment than those who exhibited decreased HRV (165). Thus, addicts who develop dispositional mindfulness through participation in MBIs may become better able to regulate appetitive responses by virtue of enhanced neurocognitive control over autonomic reactivity to stress and substance cues. The effects of MBIs on cognitive regulation of autonomic cue-reactivity might be measured with a stress-primed cue-reactivity paradigm, in which participants are first exposed to a laboratory stress induction [e.g., aversive IAPS images, c.f. (7); or the TSST, c.f. (132)], then exposed to substance-related cues (either in vivo, imaginally, or images of alcohol or drugs), and finally asked to use mindfulness skills to downregulate the resultant state of autonomic arousal. 1. Garland, E. L., Froeliger, B., & Howard, M. O. (2013). Mindfulness training targets neurocognitive mechanisms of addiction at the attention-appraisal-emotion interface. Frontiers in psychiatry, 4. Given that drug-use action schemas may be evoked by cues associated with past substance use episodes, activation of addictive habits may be interrupted by re-orienting attention from substance-related stimuli to neutral or salutary objects and events. MBIs may be especially efficacious in that regard. Focused attention and open monitoring mindfulness practices capitalize on attentional orienting, alerting, and conflict monitoring – the fundamental components of attentional control (89, 90). Consequently, studies indicate that mindfulness is linked with enhanced attention regulation (61, 91). For instance, mindfulness training is associated with strengthening of functional connectivity within a dorsal attentional network (92) and MBIs can increase attentional re-orienting capacity, i.e., the ability to engage, disengage, and shift attention efficiently from one object to another subserved by dorsal attentional systems (93, 94). Other studies demonstrate that long-term mindfulness training strengthens alerting (93,95), i.e., a vigilant preparedness to detect and attend to incoming stimuli, subserved by the ventral attentional stream. In addition, dispositional mindfulness is positively associated with self-reported attentional control (68) and behavioral indices of sustained attention capacity (70). Recently, data from a randomized controlled trial indicated that 8 weeks of Mindfulness-Oriented Recovery Enhancement led to significant reductions in attentional bias to pain-related cues in a sample of opioid-misusing chronic pain patients (96). MBIs may target addiction attentional bias by facilitating attentional disengagement from substance-related stimuli. In support of this hypothesis, a study of alcohol dependent adults in residential treatment identified a significant negative correlation between dispositional mindfulness and alcohol attentional bias for stimuli presented for 2000 ms that remained robust even after controlling for alcohol dependence severity, craving, and perceived stress (1). Hypothetically, alcohol dependent persons higher in dispositional mindfulness might exhibit increased capacity for attentional disengagement from alcohol cues by virtue of enhanced PFC and anterior cingulate cortex functionality, as these brain structures have been implicated in addiction attentional bias (97–99). Concomitantly, the degree to which alcohol dependent individuals higher in dispositional mindfulness were better able to disengage their attention from alcohol cues than their less mindful counterparts predicted the extent of heart-rate variability (HRV) recovery (an index of prefrontal-autonomic regulation) from stress-primed alcohol cue-exposure (67). Mindfulness training may also affect attentional orienting to substance-related cues. Among a sample of alcohol dependent adults in inpatient treatment, Mindfulness-Oriented Recovery Enhancement was found to result in significant effects on alcohol attentional bias for cues presented for 200 ms (7), indicating modulation of automatic initial orienting to alcohol cues [c.f. (23)]. In individual difference analyses, reductions in attentional bias following Mindfulness-Oriented Recovery Enhancement were significantly associated with decreases in thought suppression, which were, in turn, correlated with increases in HRV recovery from alcohol cue-exposure and improvements in self-reported ability to regulate alcohol urges. Hence, mindfulness training may strengthen the capacity to regulate attention in the face of conditioned stimuli associated with past substance use, countering attentional biases by refocusing attention on neutral or health-promoting stimuli (e.g., the sensation of one’s own breath or a beautiful sunset). Repeatedly redirecting attention from substance-related cues toward innocuous stimuli may foster extinction of associations between substance-related cues and drug-use action schema. This potential mechanism may explain how attentional bias modification among addicts leads to decreased substance use and improved treatment outcomes (100,101). Future research could evaluate the effects of mindfulness training and MBIs on addiction attentional bias with the use of a dot probe task alone or coupled with eye tracking and analysis of event-related potentials (ERPs) to determine at what stage of attentional selection (initial orienting vs. later attentional disengagement) training has significant effects. The urge to seek intoxication from addictive substances is driven, in part, by reactivity to substance-related stimuli which have been conferred incentive salience, and is magnified by negative affective states. Several studies demonstrate that MBIs can produce significant reductions in craving (4,8,102–105). However, other studies have failed to identify significant reductions in craving among participants of MBIs (7, 106–108). 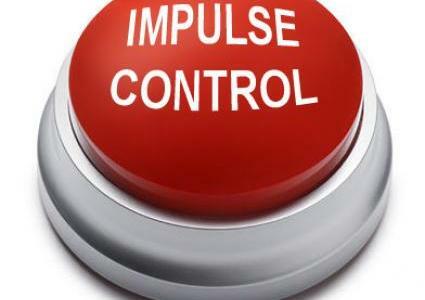 Mindfulness-based interventions may positively influence craving-related processes in several ways. First, mindfulness training may decrease bottom-up reactivity to drug-related stimuli, as mediated by reduced activation in the subgenual anterior cingulate cortex and striatum during exposure to substance cues (105). Second, mindfulness training may decouple negative emotion from craving. Although negative emotion is a common precipitant of craving and subsequent relapse (109), mindfulness training may extinguish this association, such that an addict experiencing sadness, fear, or anger could allow these emotions to arise and pass without triggering an appetitive reaction. Indeed, substance dependent individuals participating in Mindfulness-Based Relapse Prevention were less likely to experience craving in response to depressed mood, and this reduced craving and reactivity to negative emotion predicted fewer days of substance use (110). MBIs may also produce therapeutic effects by increasing awareness of implicit craving responses. Tiffany (20) proposed that conscious craving occurs when an activated drug-use action schema is blocked from obtaining the goal of drug consumption. As such, persons in acute withdrawal, persons unable to obtain drugs (e.g., due to lack of funds or availability), or persons attempting to maintain abstinence in the face of triggers may experience an upwelling of craving for substances. In contrast, according to this theory, addicts who are able to obtain and use drugs in an unimpeded fashion would not experience craving. Similarly, persons in long-term residential treatment who are isolated from drug-related cues are unlikely to be conscious of craving. Without awareness of craving, the addict may unwittingly remain in high-risk situations and thus be especially subject to relapse. Indeed, lack of awareness of substance craving has been shown to be predictive of future relapse (111). MBIs may increase conscious access to the appetitive drive to use substances by virtue of their effects on increasing interoceptive awareness (78, 112). In that regard, mindfulness training has been shown to increase activity in the anterior insula during provocations by emotionally salient stimuli (113, 114). The anterior insula subserves interoception and awareness of the physical condition of the body, among other related processes (115). Increased neural activity in the insula during mindfulness meditation may index heightened access to interoceptive information. In synthesizing the findings regarding attentional bias and cue-induced craving, we suggest that MBIs may restructure attentional bias away from drug-related reinforcing stimuli (e.g., drug-cues, negative affective stimuli) and facilitate the addict’s attempts to deal with associated cravings. We posit that mindfulness-centered regulation of cue-elicited appetitive responses occurs as a result of strengthening frontal-executive circuit-function and enhancing neural communication to the hippocampus and thalamus through formal and informal mindfulness meditation practices. The hippocampus is critical for context-dependent learning and memory – with reciprocal connectivity to brain regions that code for reward (ventral striatum), interoception (insula), affect (amygdala), and thalamus. In turn, the thalamus, a complex structure that is generally considered to serve as a relay station between limbic, striatal, and cortical circuits, contains efferent and afferent projections with striatal, limbic, somatosensory, ACC, lateral and medial PFC, and OFC. Thus, the recovering addict may utilize mindfulness training to become aware of which cues are under the spotlight of attention, and become more sensitive to how those cues may trigger changes in body state and motivation drive. Hence, mindfulness may increase awareness of craving and thereby facilitate cognitive control of otherwise automatic appetitive impulses. In that regard, a recent study found that participation in Mindfulness-Oriented Recovery Enhancement was associated with decreased correlation strength between opioid craving and opioid misuse, suggesting that mindfulness training may have decoupled appetitive responses from addictive behaviors (8). This mechanism may explain the disparate findings vis-a-vis the effects of mindfulness on craving: because of potential underreporting of baseline levels of craving among individuals with impaired insight into their addiction (34), this increased awareness may confound researchers’ attempts to measure the impact of mindfulness training on craving, resulting in an apparent lack of change in craving over time. The effects of mindfulness on cognitive regulation of craving might be measured by utilizing neuroimaging methodology (e.g., fMRI) to investigate neural circuitry function while participants attempt to regulate their craving response to salient drug-cues. For example, cognitive regulation appears to decrease cigarette craving concomitant with increased activity in dACC (116) and prefrontal regions coupled with attenuated activity in striatal regions (117). A complementary approach to probing the effects of mindfulness on regulating craving may be to utilize real-time fMRI (rt-fMRI). rt-FMRI involves providing subjects with real-time feedback of the BOLD signal within a brain region of interest (ROI) while they attempt to regulate the response within that ROI. This approach has been used to manage pain (118) and reduce cigarette cue craving in nicotine dependent smokers during smoking cessation (119). Evaluating the effects of mindfulness-centered regulation of craving-related neural circuitry in real-time may include a number of benefits including: (a) directly measuring which circuits are being effectively modulated and which are not; (b) feedback to the subject that will help guide mindfulness efforts; and (c) identifying individual differences associated with differential effects of MBIs on specific neural mechanisms. Insofar as stress evokes automatic responses and impairs prefrontally mediated cognitive control functions (120), exposure to socioenvironmental stressors may render addicts in recovery vulnerable to relapse (1, 22, 121). Mindfulness training may allay stress-induced relapse by virtue of its stress-reductive effects (122). Although early theorists believed that mindfulness meditation reduced stress primarily by evoking a generalized relaxation response (123), modern research indicates that mindfulness practice may also attenuate stress by targeting cognitive mechanisms (1, 124). One potential target of mindfulness is cognitive appraisal, the process whereby stimuli and their environmental context are evaluated for their significance to the self (125). Appraisals of threat or harm elicit negative emotional reactions coupled with activation of stress physiology. When recurrent, such emotional reactivity biases perception, leading to exaggerated, overestimated appraisals of threat and underestimations of self-efficacy (126), and ultimately, sensitization to future stressors (127). In contrast, mindfulness, which has been conceptualized as a non-reactive form of awareness (128) may enable the individual to cognitively appraise his or her present circumstances with less emotional bias, and to more accurately assess his or her ability to cope with present challenges (60). Thus, MBIs may impact both primary (rapid and implicit) and secondary (slow and explicit) appraisal processes (125). In partial support of this hypothesis, a recent neuroimaging study revealed that, in contrast to a meditation-naive control group, mindfulness meditation practitioners exhibited decreased reactivity to briefly presented negative emotional cues in frontal-executive brain regions (i.e., dorsolateral PFC) and less deterioration of positive affect in response to cue-elicited amygdala activation (31). These data suggest that mindfulness training may alter the allocation of cognitive resources during appraisal of negative emotional stimuli and attenuate the influence of limbic reactivity on mood state. Other research demonstrates that mindfulness training minimizes emotional interference from unpleasant stimuli [e.g., Ref. (129)]. In so doing, mindfulness training may reduce biases toward negative emotional information processing. Among persons with a history of depression, Mindfulness-Based Cognitive Therapy reduces overgeneral memories (130) and cognitive bias toward negative information (131). Among individuals suffering from chronic pain, Mindfulness-Oriented Recovery Enhancement decreases cognitive bias toward pain-related cues (96). Together, these findings suggest that MBIs may decrease negative emotional bias in initial cognitive appraisal processes, thereby reducing the downstream effects of stress on addictive behavior. As mindfulness-centered regulation enhances cortico-thalamic-limbic functional connectivity, the recovering addict becomes more aware of relations between attention, emotional state, and motivation. This awareness provides an opportunity to deploy cognitive strategies to respond to the environment in a more adaptable context-dependent manner, rather than responding from a pattern of overlearned reactive behaviors. Following on from our previous blog Neural mechanisms of mindfulness meditation we now use abbreviated excerpts form a very good researcher Eric Garland into how possible mindfulness helps repair, via meditation based neuroplasticity, those areas and networks of the brain which are impaired or do not function adaptively in the addicted brain. In this review paper, they described how mindfulness-based interventions (MBIs) may target neurocognitive mechanisms of addiction at the attention-appraisal-emotion interface. Empirical evidence is presented suggesting that MBIs ameliorate addiction by enhancing cognitive regulation of a number of key processes, including: clarifying cognitive appraisal and modulating negative emotions to reduce perseverative cognition and emotional arousal; enhancing metacognitive awareness to regulate drug-use action schema and decrease addiction attentional bias; promoting extinction learning to uncouple drug-use triggers from conditioned appetitive responses; reducing cue-reactivity and increasing cognitive control over craving; attenuating physiological stress reactivity through parasympathetic activation; and increasing “savoring” to restore natural reward processing. Putatively, focused attention and open monitoring emphasize or differentially activate different cognitive capacities during the mindful state, including attentional vigilance, attentional re-orienting, executive monitoring of working memory, response inhibition, and emotion regulation (62). Engaging in these practices repeatedly over time may induce neural and cognitive plasticity (7); recurrent activation of the mindful state during meditation may leave lasting neurobiological traces that accrue into durable changes in the dispositional propensity to be mindful in everyday life even while not meditating (64). Germane to the current discussion of neurocognition in addiction, dispositional mindfulness is significantly inversely associated with addiction attentional bias (1) and craving (66), positively associated with autonomic recovery from stress and substance cue-exposure (67), and correlated with various indices of cognitive control (68–70). MBI-related increases in dispositional mindfulness might be mediated through neuroplasticity stimulated by experience-dependent alterations in gene expression (71, 72). Indeed, cross-sectional studies have demonstrated significant differences in gray matter volume between meditation practitioners and meditation-naïve controls, particularly in regions of PFC that instantiate cognitive control (e.g., inferior frontal gyri) and higher-order associative processing (e.g., hippocampus) (73–77). Moreover, longitudinal research has shown that participants in an 8-week MBI evidenced increased gray matter density in posterior cingulate cortex, temporo-parietal junction, and cerebellum, compared to controls (78), and reduced amygdala volume that correlated with the degree of stress-reduction achieved from mindfulness training (79). Through focused attention and open monitoring forms of meditation, MBIs exercise a number of neurocognitive processes believed to go awry in addiction. Indeed, MBIs may be fruitfully conceptualized as means of training or exercising prefrontally mediated cognitive control networks which have become atrophied or usurped in the service of drug seeking and use. By strengthening PFC functions and the ability of the PFC to modulate other brain networks in a context-dependent manner, MBIs may provide the global benefit of enhancing neurocognitive flexibility…(e.g., cognitive regulation of automaticity, attention, appraisal, emotion, urges, stress reactivity, reward processing, and extinction learning). These processes do not operate in isolation; they are linked in mutually interdependent, interpenetrating, recursive networks [for reviews, see Ref. (2, 3)]. MBIs may restructure dysregulated processes by strengthening functional connectivity and efficiency of prefrontally mediated self-regulatory circuits (see Figure2). Below, we propose a number of hypothetical neurocognitive targets that could mediate the therapeutic effect of MBIs on addictive behavior. Figure 2. Mindfulness-centered regulation: the central tenet of this model posits that mindfulness-based interventions (MBI’s) may remediate dysregulated habit behaviors, craving, and affect primarily by way of strengthening functional connectivity: (1) within a metacognitive attentional control network (PFC, ACC, Parietal); and (2) between that metacognitive attentional control network and the (a) habit circuit, (b) craving circuit, and (c) affect circuit. Substance dependent individuals typically experience euphoria during initial stages of drug-use. Yet, as experience with the drug increases, the reward associated with drug-taking becomes dramatically attenuated. Despite diminishing returns in positive emotional experiences resulting from substance use, dependent users continue to use their drug of addiction. Undergirded by neuroplastic changes in striatal circuitry, habitual drug-use becomes an overlearned process that can become automatized (12, 80). Though more investigation is needed to elucidate effects of mindfulness on brain-behavior relations subserving drug-use action schemas, early research on the effects of mindfulness on behavioral measures of automaticity has emerged [e.g., Ref. (82)]. Such research provides a theoretical foundation for the potential efficacy of MBIs for interrupting drug-use action schemas. Hypothetically, mindfulness training may increase awareness of the activation of drug-use action schemas when triggered by substance-related cues or negative emotion, thereby allowing for the disruption of automatized appetitive processes with a controlled coping response. As posited in our model of mindfulness-centered regulation (Figure 2), mindfulness training may enhance functional connectivity in a cortico-thalamic loop including prefrontal, cingulate, parietal, and dorsal thalamus nodes, strengthening an executive regulatory circuit providing feedback to the striatum and medial temporal lobe. This feedback process is theorized to allow for greater consciousness of thoughts and behaviors that were previously enacted with little conscious awareness. The practice of mindfulness in daily life is focused on developing awareness of automatic behavior. Indeed, many MBIs prescribe informal mindfulness practices where individuals are instructed to engage in everyday, repetitive tasks (e.g., washing the dishes) with full consciousness of the sensorimotor aspects of the activity. Such informal mindfulness practices are designed to reduce mind-wandering and strengthen conscious control over automaticity. Potentially as a result of such practices, mindfulness training has been shown to decrease habit behavior (83) and reduce rigid adherence to scripted cognitive responses (82). These findings accord with early theoretical accounts which conceptualized mindfulness meditation as a form of “deautomatization,” whereby patterns of motor and perceptual responses which had been rendered automatic and unconscious through repetition are reinvested with conscious attention (84). Thus, is plausible that mindfulness training may deautomatize habitual addictive responses through both formal meditations focused on regulating automatic appetitive impulses as well as informal mindfulness practices designed to increase generalized awareness of automaticity. 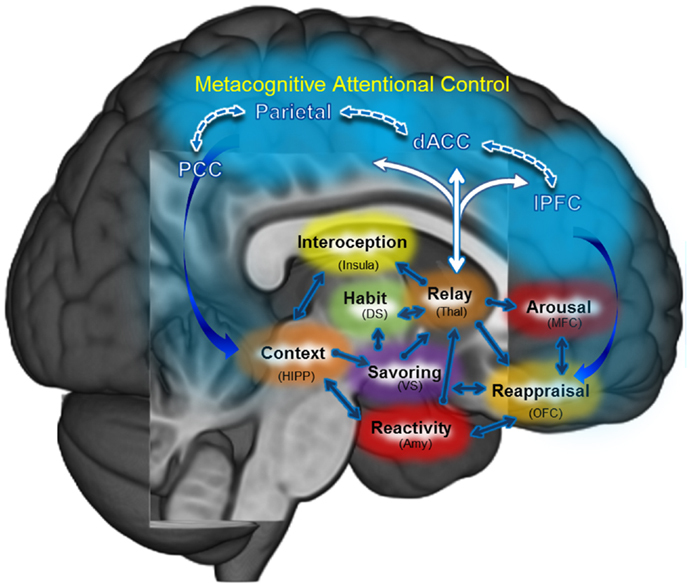 In light of findings suggesting that conscious cognitive control disrupts automatic processing (20, 85–87), mindfulness training may interrupt drug-use action schemas by augmenting top-down control via a frontoparietal metacognitive attention network, facilitating the strategic deployment of self-regulatory processes to reduce or prevent substance use. The effects of mindfulness training on inhibition of habit responses might be indexed with performance on an Emotional GoNoGo task (88), where subjects would be asked to withhold automatized “go” responses in the context of emotional interference from a drug-related (i.e., a drug-related background image) or negative affective stimulus (i.e., an aversive background image).